To effectively evaluate technology and innovation, the MITAC develops and conducts a number of testbeds. International testbeds offer a unique opportunity to understand cultural diversity and remoteness. With telemedicine testbeds in several countries, MITAC needed to mange and integrate various types of patient information into one electronic medical record (EMR) system, irrespectively with their locations and languages. This EMR system serves the purpose of clinical consultation platform, and an interactive tool for distance education. MITAC is working closely with the American University of Beirut (AUB), School of Medicine in mutually beneficial areas of telemedicine and distance education. MITAC is integrating telecommunication applications, and multimedia data streaming into the medical education curriculum. Integration of distant education for content delivery from VCU to AUB will provide AUB faculty and students with a unique opportunity to participate in distance learning in a variety of disciplines, including telemedicine. Communication links are currently being tested between MITAC and AUB to permit regular videoconferencing for collaboration in the areas of telemedicine, distance learning, and distance surgical education. Additionally, MITAC's telemedicine course will be translated into Arabic for access to a wider audience in Beirut. MITAC's postdoctoral research fellow, Dr. Hatem Halabi, who is interning this year at AUB, will mentor this course. The MITAC is working closely with three different institutions in Romania in mutually beneficial areas of telemedicine and distance learning. These different institutions include: (1) the Fundeni Clinical Institute in Bucharest, (2) the University of Medicine and Pharmacy of Craiova in Craiova, and (3) the Faculty of Medicine and Pharmacy of Constanta in Constanta. The purpose of these projects is to improve the delivery of health care in the region and to promote telemedicine and distance learning. The efforts with Fundeni are conducted towards the transmission of live surgery clinics every week and participation in the VCU's Surgery Grand Rounds. MITAC will also assist in establishing a Romanian Telemedicine Association and in developing a regional plan. The University of Medicine and Pharmacy in Craiova is working closely with the MITAC in seeking an infrastructure grant from NATO. Mr. Charles Doarn, MITAC executive director, will serve as the project director, providing feedback to NATO on the progress of the collaboration. This collaboration is to build an infrastructure between several medical facilities within Craiova to support telemedicine, education, and high resolution image transfer. The work in Constanta is focused on the use of telemedicine to provide healthcare in remote locations of the delta of the Danube River, establishing a Center of Excellence in surgical training and telemedicine, transmission of VCU's Department of Surgery Grand Rounds in real time, and participation in a project on maritime telemedicine on the Black Sea. MITAC is working with a variety of computer controlled robots, provided by Computer Motion to better assess surgical skills in an open surgical field projected on standard video monitors. Computer Motion, Inc. is an industrial affiliate of the MITAC. It has provided both donated hardware and inkind labor in a mutually beneficial collaboration. One of the robots is the voice-activated AESOP robotic arm. Through voice control, AESOP can precisely place a 10mm laproscopic camera in close proximity to the sterile surgical field. This permits a very useful view of the open surgical field for collaborators within the operating room or those outside of the immediate area. The goals of this effort are to assess surgical skills with the surgeon and assistant viewing the test surgical field exclusively on video monitors. 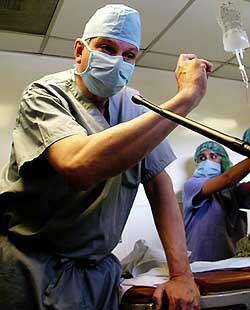 Surgical tasks are timed as they are carried out under various angled camera placements. Skill assessments are done to evaluate surgical adaptability if one is limited to visualizing the surgical field to a 2 dimensional image on the monitor. This kind of work will provide validation of more efficient tools and methods for collaboration and teaching. A group of University of Chicago archaeologists recently visited the Republic of Mongolia on a mission to confirm the site of Chinggis Khan's tomb. The American-Mongolia expedition consisted of 60 individuals, the majority of which were Mongolian. The tomb site is believed to be in the northern provinces near Ulaan Bataar. The team had access to medical care from Dr. Gregory Merrell, an orthopedic resident from Yale University. In addition, an individual with EMT training was also present. The nearest hospital was 12 hours by 4-wheel drive vehicle. MITAC provided Dr. Merrell the necessary hardware and software to conduct telemedicine from this remote location. Telecommunications was supported by an InMarSat phone, digital camera, and laptop computer. In addition, there was a full complement of medical capability on the ground with the expedition. During the mission, the telecommunications link was used for four clinical cases. The cases included a pit viper bite on the ankle, an anthrax epidemic in the valley due to cattle, eye injury, and skin rash. In all cases, information was provided to physicians at the Virginia Commonwealth University's Health System and MITAC. Responses were prepared and returned within 24 hours. Dr. Merrell summarized, "Timely response is crucial. If it is concerning enough to hook up the sat phone, then it is likely urgent enough to require a timely response." During the summer of 2002, VCU physicians, allied health personnel, and medical students traveled to two unique environments, Brazil and Kenya. Both missions were focused on medical relief in the area of infectious disease. Both teams were connected to VCU's MITAC via communication tools to support telemedicine interaction. The team in Brazil was equipped with an Iridium phone and personal digital assistants (PDA) for epidemiological data collection. The team in Kenya was equipped with PDAs and an InMarSat phone for communications between sites in Kenya and MITAC. The locations in Kenya are remote and without electrical power. MITAC developed and implented a power capability using two deployable solar panel grids, which provided charging power to an automobile battery. The battery in turn provided electrical power to the lap top computers and the satellite phone. Both systems were capable of sending medical information from remote sites to MITAC for interaction with medical personnel. During this mission, data was transferred between remote clinical sites in Kenya and MITAC. MITAC's purpose was to examine utility, utilization, and cost. Ecuador is an ideal location for conducting test beds in telemedicine and telementoring to explore how nascent technologies can be integrated into medicine in remote and extreme places. Beginning in May 1999, MITAC developed a project in Ecuador to demonstrate that telemedicine was a cost-effective way to pre-operatively evaluate patients in remote villages. The project has expanded to include telementoring of medical or surgical consultations to very remote areas where a general practitioner or a layperson might be the only healthcare provider. Through lessons learned and experience, project objectives have expanded to include examination of the prospects for 1) continuation of telemedicine as a pre- and post-operative tool; 2) expansion of telemedicine beyond surgery so that medical advice could be provided from larger medical centers to remote villages; 3) development of an electronic medical record so that transmission of information would be easier; 4) development and implementation of an electronic database to expand knowledge of indigenous medicines and treatments; 5) train our partners at the Fundacion Cinterandes in Cuenca and other Ecuadorian groups to become self-sufficient with regard to teleconferencing and transferring data to and from remote areas of Ecuador; and 6) evaluation of high frequency radio as a mode of transmitting medical data. During the past two years, several successful trips to Ecuador have taken place to advance the project objectives. Teams of medical and technical personnel have completed many objectives, including: electronic transmission of preoperative patient data; installation of Electronic Medical Record (EMR) in Ecuador and training of collaborators in entering, exporting, and importing data; transmission of text files (10kb) from remote villages to larger cities using high frequency radio; transmission of EMR-exported data file from Taisha to Macas using high frequency radio, radio modem and software; transmission of data from Macas to Cuenca via Internet; and a telesurgery conference, Cuenca to Richmond -- transmission of live hernia surgery from a mobile surgical truck with images from laparoscopic camera held by alpha-port, while surgeons in Richmond identified key structures. MITAC's industrial affiliate, Televital has been a key partner in accomplishing MITAC's plans and objectives in Ecuador. 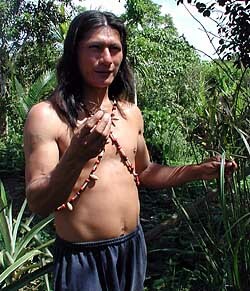 An additional project in Ecuador has been to communicate with the Shaman of the indigenous people to collect data on their treatments and use of medicinal plants. With the collaboration of scientists familiar with the area and the people, the teams have been collecting information on the indigenous medicines and practices and entering it into an electronic database, with the goal to create a CD of pharmacopoeia. Some of the future plans with partners in Ecuador include self-sufficiency for the Fundacion Cinterandes: telemedicine techniques and use of video-conferencing in the OR and remote sites; data collection using EMR; imaging studies; and preparing a mobile surgical boat. MITAC has partnered with Fundacion Cinterandes, Salesian Procura - Province of Morona-Santiago, Clinic Luxemburg of Morona-Santiago, and the Hospital San Jose de Thaisa. As an extension of previous work with telesurgical monitoring of both laparascopic and open surgery, the project in Ecuador has extended MITAC's capabilities to include the monitoring of basic physiologic parameters during surgery. In much the same way that surgical consultation has been enabled by use of the RDTU, anesthesia consultation is now available for remote situations. 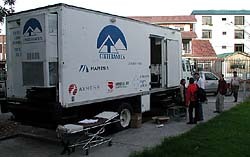 During the December 2001 trip to Ecuador, surgery was performed in the Cinterandes Foundation Mobile Surgical Facility in Sucúa. The surgery, an open cholecystectomy, saw the first known transmission of real-time physiologic parameters for distant anesthetic monitoring. Dr. Lynne Gehr, a faculty anesthesiologist at MCV/VCU monitored the transmitted data in the MITAC laboratory, while Dr. Patricio Escandon, a member of the faculty of Yale University's Anesthesiology Department, was the local attending anesthesiologist. Much of the clinical data transmission was made possible and more effective by MITAC partner Televital's telemedicine software. MITAC has been providing lectures on Telemedicine and Medical Informatics to M5 students from MMA's Student Surgery Club with weekly videoconference sessions. Working with a computer-controlled robot (AESOP) MITAC's team was able to significally improve the quality of on-line tutoring in surgery. The students and faculties from ISSR had an opportunity to test the new features and advantages of the new method during the series of surgeries transmitted from MCV to ISSR. MITAC also continues close collaboration in distance education with Space Biomedical Center for Training and Research (SBCTR), and the Faculty of Fundamental Medicine (FFM) at Moscow State University. With technical support from SBCTR, medical students from MSU had an opportunity to attend the series of lectures on Medical Informatics given by Dr. Merrell and Charles Doarn. In 2002/2003 MITAC has signed two agreements on collaboration in Telemedicine and Distance Education with Kazakhstan National Medical University (Almaaty, Kazakhstan) and Medical Faculty of Kazan State University (Kazan, Tartarstan). More details regarding our work with Former Soviet Union can be viewed on line here. 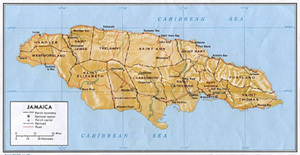 On Thursday, March 1, 2001 Surgical Grand Rounds were presented from the Cornwall Regional Hospital in Montego Bay, Jamaica. MITAC supported the interactive conference using a state-of-the-art, portable satellite system used for telemedicine initiatives around the globe. The Templeton Lecture was introduced by Drs. Ronald Merrell and Charles Bagwell and presented by the Permanent Secretary of Health, Dr. George Briggs. This joint collaborative effort with VCU is designed to promote telehealth in the islands of the Caribbean and beyond. Exchange of data, research and clinical issues will help to promote quality healthcare in Jamaica and serve as models for other developing countries. You may hear Dr. Briggs' presentation by clicking here. During July and August of 2000, MedITAC participated with researchers from NASA, other educational institutions, and private organizations in the Mars Arctic Research Project. The MARS project, officially NASA Haughton-Mars Project 2000 (HMP-2000) consisted of field researchers from all branches of space science converging on Devon Island in the Arctic Circle to study and test a multitude of space-related technologies. The MedITAC research consisted of field testing the Vital Signs Monitors as well as testing the medical protocols for a simulated emergency on the surface of Mars, where a 22-minute delay in each direction makes communication considerably more difficult. The protocol test consisted of a simulated medical emergency on-site at Devon, with wireless transmission of physiological data back to monitoring physicians in the US, Canada, and Ecuador. In addition, the general public could access the physiological data in real-time (with 22-minute delay to simulate Mars communications), to show the possibilities of future health monitoring technology in daily life on Earth. More details can be found at /mars/. MITAC sent two of its members to Turkey with the Physicians for Peace (Norfolk, VA), to assemble a multimedia course on landmine victim rehabilitation. Much of southeastern Turkey is heavily infested with landmines, and victims that survive often lose one or more limbs. The Physicians for Peace mission consisted of surgeons and prosthetists to fit victims with much needed prosthetic devices. Our efforts focused on developing an onsite multimedia curriculum that can be used for landmine relief efforts anywhere in the world. On March 18, 2000, the team departed for a mission, our goal was to provide surgery and medical care at the Hospital of Samana, Dominican Republic. Test beds such as this allow us to fully assess the feasibility of sending live images over low-bandwidth connections with today's H.323 video conferencing applications like CuSeeMe, NetMeeting, etc. The team connected by a point-to-point method and multipoint server via the Internet. This enabled patients to be monitored from a remote clinic, (in this case VCU) for diagnosis of the patient. Once the data was collected from the patient to populate a database, a collaborating surgeon shared database tools and whiteboards during a live videoconference. MITAC established a relationship with the Ministry of Health in Egypt. This relationship included the exchange of faculty, site reviews as well as the participation of several Egyptian medical personnel and computer specialists in the MITAC's Principle of Telemedicine Course. Staff at Yale University, a MITAC member, have collaborated with several medical organizations in Greece, including Red Cross Hospital, University of Thrace, Hatjikosta Hospital, and Macedonia University. In April and May of 1999, a group of Yale physicians and researchers embarked on a mission to Mt. Everest. The 1999 activity was called Everest Extreme Expedition (E3). Encamped at Everest Base Camp (EBC) (17,700 feet), physicians and scientists supported telemedicine activities, monitored several climbers as 'physiologic ciphers', evaluated new technology, and conducted research to further the understanding of cardiovascular response in extreme environments. A vital signs monitor, developed by FitSense (Boston, MA) for monitoring climbers on the mountain, was demonstrated. This technology shows promise as a useful tool in monitoring a climbers' position and physiological status. During the expedition, grand rounds were conducted between EBC and Yale University through a 128 kbps link. On several occasions, real life-threatening medical emergencies occurred during these real-time interactions, such that the medical staff at EBC were consulted by and mentored by the medical staff at Yale University. E3 was made possible in part from financial support through a partnership with Olympus of North America, St. Charles Hospital, LECO, Millennium Health Care Solutions, and the Explores Club. A number of other organizations, including Bectin - Dickinson, Kodak, Nestle, and CamelBak donated supplies, including food, clothing, film, and medical supplies. In the coming months, 13 manuscripts will be prepared and submitted to refereed journals for publications. Two have already been submitted, one to JAMA and one to the Telemedicine Journal. The expedition provided a unique opportunity for school children to get involved in the expedition. Several video teleconferences were conducted between EBC and schools in on both the east and west coast. In addition, daily activities of E3 team members and progress of the mission were posted on the Web at /e399/. During the expedition, the number of hits to the Web site were over 1 million.